Paintings normally require canvas and most theater takes a stage, but carvings can come out of almost any material – a fact which some talented artists have put to into practice in amazing ways. 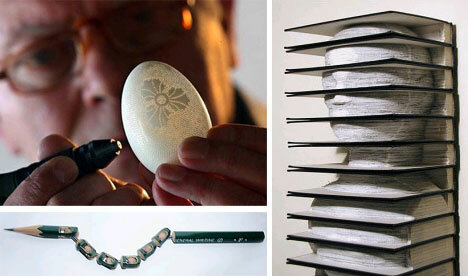 Most people are familiar with amazingly carved ice statues and perhaps even giant cheese sculptures, but what about eggs, pencils or books? Here are three approaches to carving used to create amazing art from ordinary (and often fragile) objects. 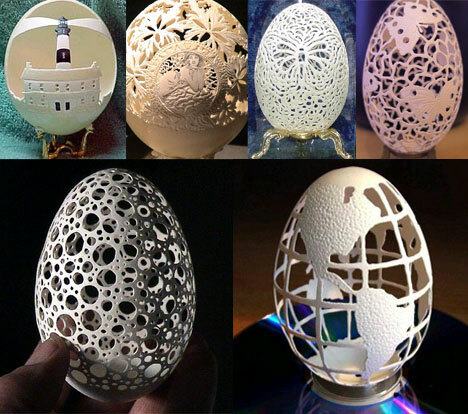 Lew Jensen, Don Lisk and Brian Baity and others have approached the art of egg shell carving in a variety of ways and with strikingly varied results. Some artists work layered reliefs into the seemingly one-dimensional shells, others are subtractive and emphasis the relationship between figure and void. One set of artists has even gone into the business of taking larger bird eggs to create lamp shades. Mizuta Tasogare and Kato Jado divide their incredibly intricate pencil carvings into four basic types and the rest they consider variations on these basic themes. Any mistake, they note, is fatal for an individual work which must remain intact throughout the delicate carving process. 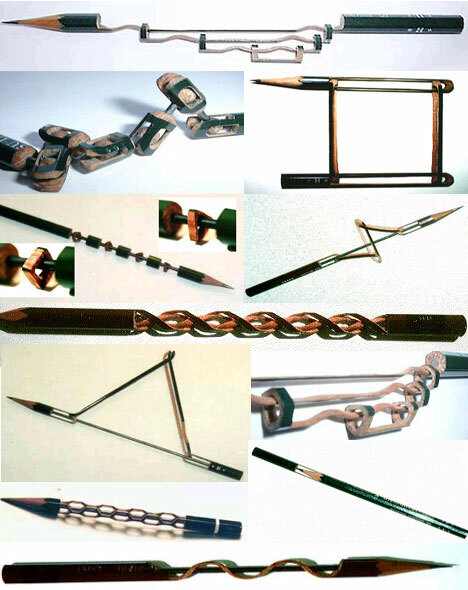 Creating link after link without breaking through thin wood barriers and while dealing with the material change between the graphite and surrounding wood is extremely challenging. 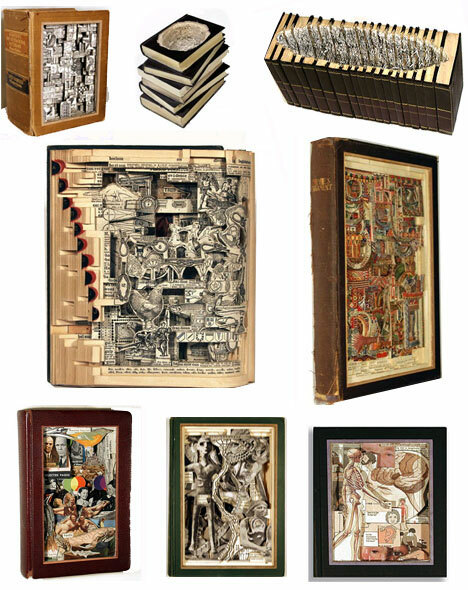 Brian Dettmer is a kind of “book surgeon,” performing “autopsies” on old volumes with engaging three-dimensional results. He uses an array of precision instruments to create or reveal patterns within a given book or set of books, often taking advantage of the particular appearance, form and content of his subject material. In many cases, the connection between the material, process and product is overtly evident, as he reveals an interpretation the past through history books and the dissects virtual bodies via anatomy texts.